What Did I Do To Make Things Worse? Have you ever walked away from an argument with your partner, just scratching your head wondering, “I don’t even know why my partner was soooo upset with me.” Not to worry. 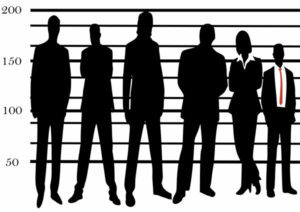 You simply look in your wallet and purse and find your ‘Round Up My Usual Suspects’ card. On this card you, and your partner, have checked off the likely suspects of your disrespectful behaviors. Get the graphic above for free here. Which behavior of mine is suspect? For most people, just reviewing the front and back of the card, with two or three of those boxes checked, is enough to have your amends ready when you reconnect with your partner again. You’ve pre-checked those behaviors that are most likely to be the problem; at least on your side of the fence. Your partner can be given a yellow highlighter and he, or she, will highlight the one main behavior that is most annoying. Conflicts are so often simply reruns of the same problem. For instance, interrupting, raising your voice, talking like a parent or a boss, getting defensive, dismissing or minimizing feelings, deception or not doing what you said you’d do. Most people are repeat offenders of just one, or a few, of these behaviors. It’s really helpful for you to acknowledge your awareness of your part in the conflict in your FIRST WORDS when you reconnect. 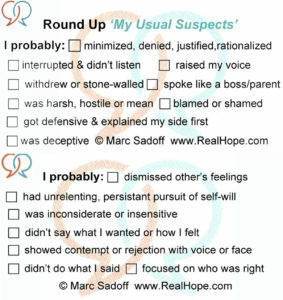 The My Suspects card is extremely useful as a guide to what your FIRST WORDS will be, in response to your upset, hurt, or angry partner’s loud tone of voice. There’s nothing wrong with explaining or defending your point of view when your partner is upset with you. EXCEPT, when your first words are explanatory, defensive, or avoidant of the issue your partner is trying to tell you about. Just ask yourself what you’d want to hear from your partner, when you tell him, or her, about something that bothers you. Let’s say you noticed that your partner was interrupting you too quickly or too often, and it was beginning to bother you. When you say this, how would you feel if the first 5 or 6 sentences in response to your expression was explanatory and defensive. Or, would you rather that your partner’s first words were, “I’ve probably been interrupting you too much.”? When your partner explains, defends, minimizes, blames, denies, or avoids the issue you bring up; it makes you reasonably believe that there will be no change in the future. 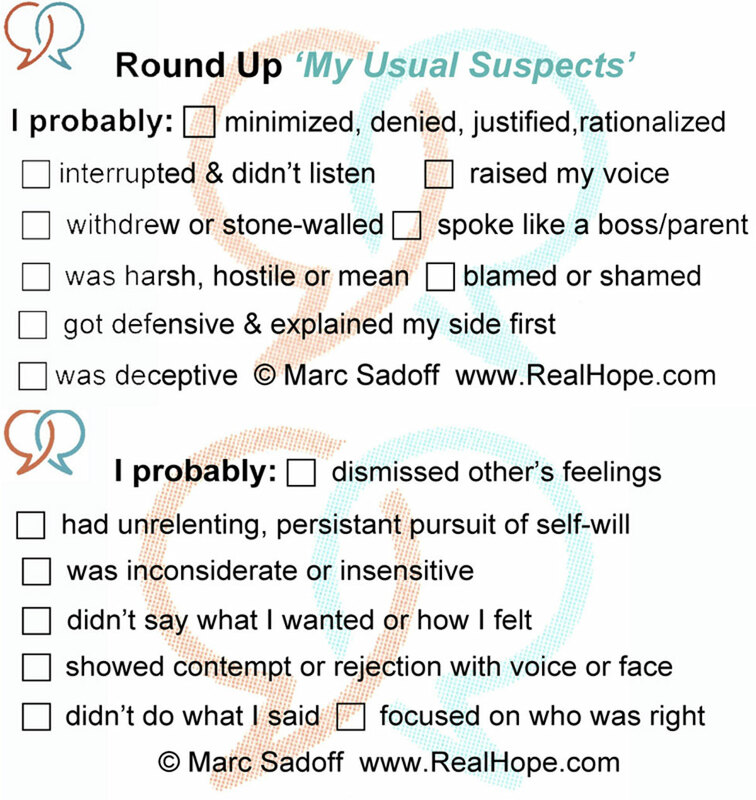 So in the future, make your FIRST WORDS, in response to your upset partner sound like it came from the Round Up My Usual Suspects card.